Engineering is an important industry within electricals, aerospace, health technologies and nuclear technologies. Businesses are urging for more engineers to help improve the world as we see it, by building a better and brighter future. 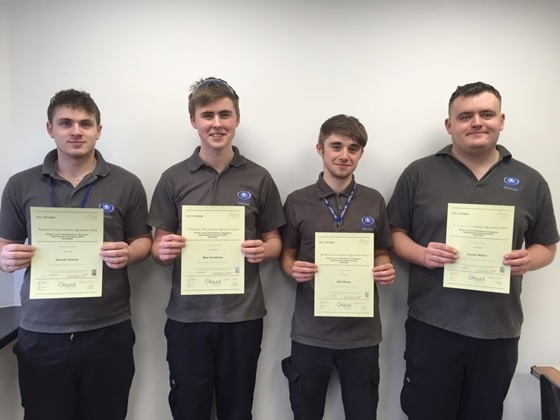 Here at Airedale Springs, we understand the importance of apprenticeships. As a leading spring manufacturer in the UK with an enviable global reputation, we know our apprentices represent the future of engineering. Wales has introduced a new engineering qualification, developed by Semta – the engineering skills body, to encourage the training of more engineers, to put the country on equal footing with other countries across Europe. Wales is set to join a number of other European nations where master craftsperson qualifications are recognised, including Germany, Switzerland, and Austria, following the launch of a new qualification by Semta. Employees in the engineering sector have been urged to seize the opportunity to grow their own talent and close the nations skills gap with the launch of a new skills programme. The new qualification will allow engineering businesses to train the high-level engineers needed to stay competitive, and with the Royal Academy of Engineers estimating that Wales will need more than 2,500 engineering graduates over the next three years, this new qualification could be what can urge the training of more engineers. Nearly 40% of workers in the advanced manufacturing and engineering sector are aged over 50, and nearly 10% are over 60 and set to retire within the next five years. With just 6% under 25, the shortage of engineers could be set to worsen if more are not trained. Engineers have recognised schools should play their part in helping the engineering industry for the future. By teaching pupil’s creative problem solving, they are encouraging more pupils to think like engineers. The Royal Academy of Engineering has stated that a focus on ‘playful experimentation’ could boost learning throughout UK schools. The UK’s shortage of skilled engineers is well recognised, and through pilot schemes, the curriculum would help meet the challenges of raising skill levels in the UK. Three pilot schemes ran in England and Scotland from 2014 to 2016 across 33 schools, and a further education college. It involved 3,000 pupils and 84 teachers. The scheme aimed to encourage engineering habits of mind in pupils, and teachers were prompted to step back and allow the children to experiment and make mistakes. Thinking like an engineer, run by Winchester University, which encouraged pupils to work across science, maths computing, design technology, and art. Tinker Tailor Robot Pi, run by Manchester University, which encouraged pupils to ‘tinker’ with readily available materials in design technology, science, and computing lessons. Primary engineer, which helped teachers in Glasgow and East Ayrshire to embed engineering into their lessons. Overall, improvements were found, not only in science and maths, but in pupils’ artistic abilities, communication skills, and confidence. Also, teachers became more open to children’s ideas. If you would like to know more information about what we offer, don’t hesitate to get in touch with a member of our team today.